Conventional Wisdom Tells Us That It’s Wrong In Every Instance To Bomb Children. Conventional Wisdom Isn’t Always Correct. Typically the characters to be found skulking through the pages of Promethean Times are a dark and sorry lot of maladjusted degenerates, ne’er-do-wells and comical third-world despots. And yet, history sometimes offers those examples of human endeavor which are not only significant and worthwhile, but also–rarest of all–interesting. We present to you, the Candybomber. If sweetheartery were an award (or even a real word), the Candybomber would be a perennial winner. Get Yourself Some Jobs, You Master-Race Malingerers! Although many younger readers many not be aware, Americans have not always been despised around the globe as arrogant behemoths trampling the rest of the world beneath their overpriced Nikes. There was a time, only a few short generations ago, when America was revered as a bastion of hope, and a force for good in a bleak and increasingly repressive world. As the occupying forces in Germany and Japan following their defeat at the end of WWII, a generation of earnest and well-meaning young men served to bolster this impression. The former enemies were disarmed by the Americans’ kindness, generosity and magnanimity, and in this the Allies achieved a victory far greater than anything they were able to accomplish with military means. That Japan and Germany are today stable, democratic–and for more than a half-century, peaceful–republics, is in some ways a credit to these exemplary young men. Dude, You Know They’re Gonna Expect Us To Act Like This From Now On. But Gail Halvorsen, the Candybomber, stands head and shoulders above them all. Despite the cruel handicap of being a dude with a chick’s name, in 1948 the young pilot exploded into the hearts and minds of young Germans, who, though now well into middle-age, still revere the Candybomber to this day. The Candybomber Is A Lot Like David Hasselhoff In That The Germans Love Him. The Difference Is That The Candybomber Did Something To Earn Their Affection. In 1948, Soviet Premier Josef Stalin sealed off West Berlin (as the nice part of Berlin was then known), hoping to starve out the fledgling democratic republic. The Allies, under the leadership of American President Harry S Truman, began an heroic, round-the-clock operation to ferry supplies to the beleaguered krauts. 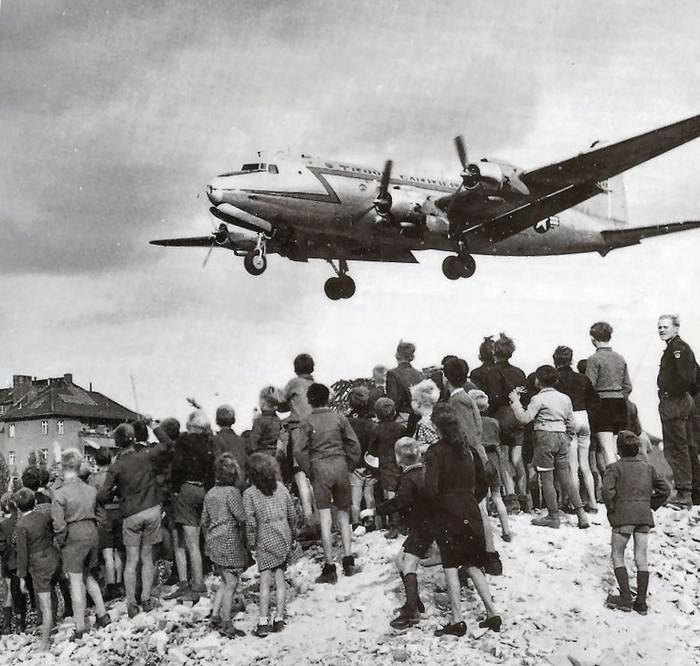 This operation, known as the Berlin Airlift, proved an historic success, forcing Stalin to ‘blink’ in May of 1949, lifting the embargo. We’re Not Sure How To Write ‘IN YOUR FACE!’ In The Cyrillic Alphabet, So The Sentiment Will Have To Suffice. Halvorsen, however, wanted to do more for the war-wearied children he saw lining the fences around the airbase. The nice Mormon boy from Utah hit upon an idea that was an instant winner: he attached small parachutes to bags of candy he had purchased himself, and his plane approached Berlin, would toss them from his plane to the grateful children below. To differentiate his plane from the dozens arriving every hour, he would dip his wings before releasing his payload, earning him the typically ridiculous German nickname Onkel Wackelflügel (Uncle Wiggly-Wings). You’ll Want To Step Back A Bit, Kids. That’s Not Candy. Rumor has it that upon hearing of Halvorsen’s actions, his Air Force superiors ordered him to stop. However, someone up the food chain quickly comprehended the PR goldmine which had fallen into Allied hands thanks to Halvorsen’s do-gooderism. The Allies ran with it, and ‘Operation Little Vittles’ was born, magnifying Halvorsen’s individual act of kindness on a grand scale. It remains one of the most unheralded–and successful–American PR campaigns in history. For Real, Folks–We’re Not All Bad. Hey, where is this guy’s movie? He deserves some Hollywood time! Or at least a Movie of the Week on Lifetime. Great share! I envy your literary skill and dry humor. Thanks for telling me a part of history I was unaware of. I wish we were still, ‘a bastion of hope’. I’d say ‘there’s always hope,’ but hope doesn’t mean what it once did. Always good to see a heartwarming story, and this one certainly is! Well, sure. I mean, if you edit out the profanity, I hear that phrase all the time! But vulgarity is our secret ingredient! Mum’s the word, now. I love the title of this one…Weapons of Mass Delight! But why the hell did I not know of this!? A great story….and very amusingly told! Thanks, Alex! I’m perplexed as to why the heart-warming and historically-significant story of the Candybomber isn’t better known. As I mentioned in a previous comment, I think part of that might have to do with the fact that Americans haven’t yet seemed to embrace Mormons as real Americans. I think part of it is that we’ve become so cynical (and here the pot is definitely making aspersions about the kettle) that we can no longer swallow a story of such sweetness. Our stories of heroism these days must necessarily be tempered with some bitterness, such as the current movie “Red Tails,” where the heroic accomplishments of the Tuskegee Airmen can only be fully appreciated through the lens of American racism. You mean to say that no one has suggested that we gave those kids dental rot and diabetes? And added to the cruel stereotype that krauts are chubby little schnitzels. Thanks for the comment, Jojo! That in itself is going to keep the smile on my face all day long. You sir are a star and this is a great post. Here I’m waiting in line at the bank chuckling like crazy. Good stuff. I needed this. Really. What a fine act of generosity. Just goes to show what one man, a multi-million dollar aircraft, and an idea can accomplish! True story, my dad had a Polish friend who was captured and forced into the Soviet army in WWII, then was captured by the Germans and put in a slave labor camp. He was liberated by the Americans, later moved to America, and remained a loyal American citizen for the rest of his life. Listening to his story as a kid, he always made me proud to be an American. I guess we got a few things right. Ah, the Berlin Airlift and the Marshall Plan. One of our last great shining moments. Awesome story, Smak. But I still have to admit, that photo of the B-2 Stealth dropping a payload really gives me wood. Wood? Hmm. So, I’m gonna go ahead and buy you that book on male/female anatomy. Don’t thank me, that’s not necessary. While waiting for your book to arrive (thank you for your kindness, btw), I looked up male/female anatomy on Wikipedia. Now I’m confused and I want to know what that stiffness in my pants is. Did you recently shoplift a zucchini, then forget you did so? You might wanna check. This might explain a few things. Positive side – Zucchini bread! Thanks for sharing this story- again. Maybe the good points of our history will repeat themselves -someday.